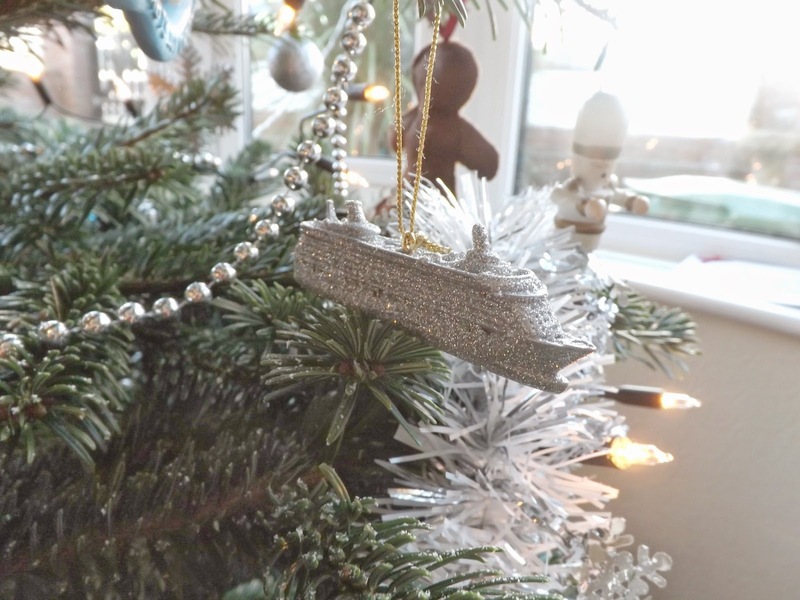 This is my first year having a real Christmas tree - I had never really seen what all the fuss was about with real trees previously and have always stuck happily with my pre-lit artificial tree, but this year we tried out a tree from Pines & Needles. 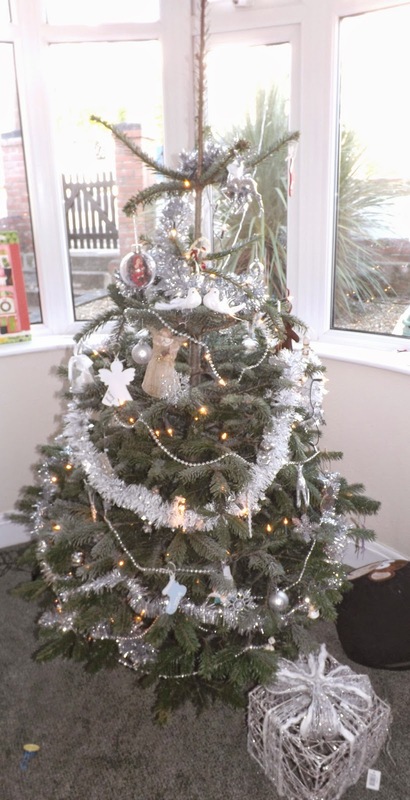 The appeal for me was that all the fuss that goes along with a real tree was removed - there was no going out and having to choose it and bring it home - it was delivered right to our front door! I have to say, I think I've been converted! The tree looks so much fuller and wider than an artificial one, and I just love staring at it all lit up of an evening - although I have fallen in love with real trees I still have no desire to go out and lug my own home, so I will certainly be calling on the convenience and reliability of Pines & Needles for Christmases to come! When it comes to decorating the tree, I am usually a "more is more" kind of person who loves to throw multi-coloured decorations on but this year, for some reason, I thought it might be nice to hold back a little and stick with two main colours - I had a look through my decorations and decided that as white & silver were what I had the most of, those would be my colours. I know that a lot of people aren't keen on tinsel these days but to me it is absolutely not Christmas without tinsel on a tree! I also love beads, so I mixed silver beads and silver and white tinsel - I always argue with myself between having a star or an angel on the top but as my angel is gold, the star won this year! I always like to give my tree a good old spraying of artificial snow too! I like the way it lands on the baubles and finishes their wintery look of! This bauble contains a photo of Tyne during his first visit to Santa - it was taken last year when he was 9 months old and we bought it from the Grotto themselves - I absolutely love that it's captured Tyne's first Christmas and I love the pose of him looking in wonder up at Santa. The white angel, as you can see, bears the name of my Grandmother - Nanny Smith. 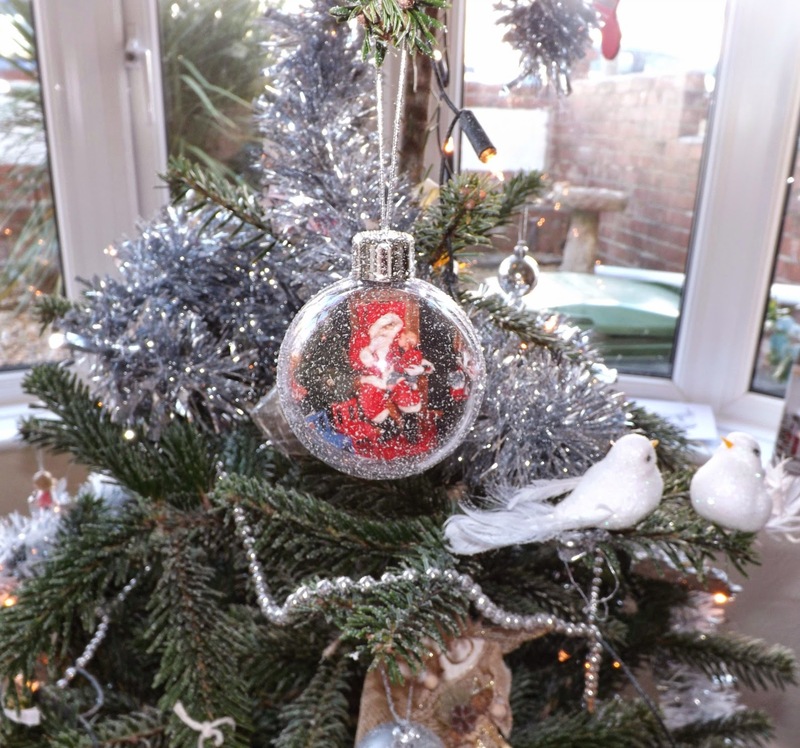 She passed away last year in June, and so at Christmas time I made the angel as a way to remember her and feel that she was with us at Christmas - I have since decided to hang her on the tree every year, where she can be part of the Christmas celebrations with us - I think fond memories of her every time I see it. The back of the angel says "Never forgotten". Also in this shot, you can see my gold angel! This is a decoration that has belonged to my family for years and somehow came into my possession! This pair of doves represents me & Jon - they are always placed together on the tree!! This little stocking is one I made last year for Tyne's first Christmas, and again is something I will hang out every year. This is the Independence Of The Seas cruise ship - those who know me well know that I am obsessed with cruise holidays, and the Independence Of The Seas was the cruise ship that Jon & I had our first proper holiday together on - we absolutely adore the ship and that holiday was the best one of my life - we bought this decoration onboard to remember the holiday of our lifetimes! And finally this little guy was a decoration from my Aunt's Christmas tree - when she emigrated to Spain she let me take something from her house to keep in mine as a memento (It may sound quite melodramatic but I obviously don't see much of her now she lives abroad, and her leaving her home where I'd visited her all of my life was quite emotional!) - I chose this as it reminds me of her so much! 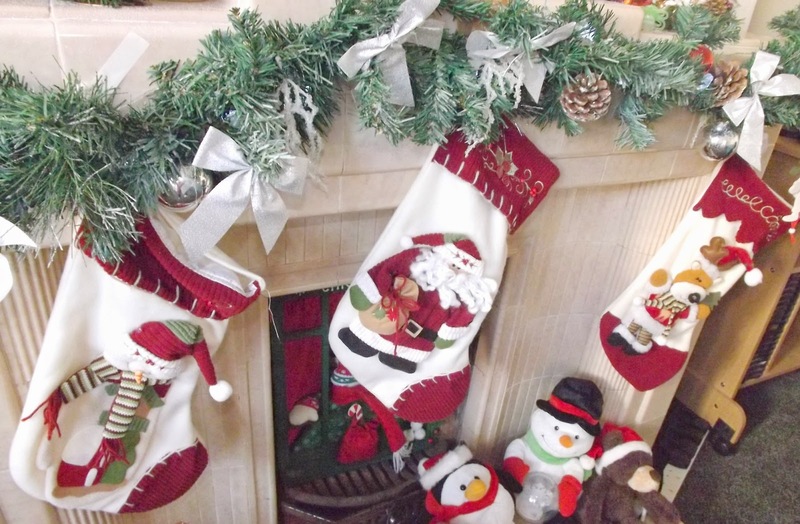 Our tree is not the only decor in the room of course - there is also the fireplace which is adorned with a snow-sprayed garland featuring silver bows and pinecones, with our 3 matching stockings hung up ready for Santa! I have some Yankee Candles (i`m obsessed with collecting them!) 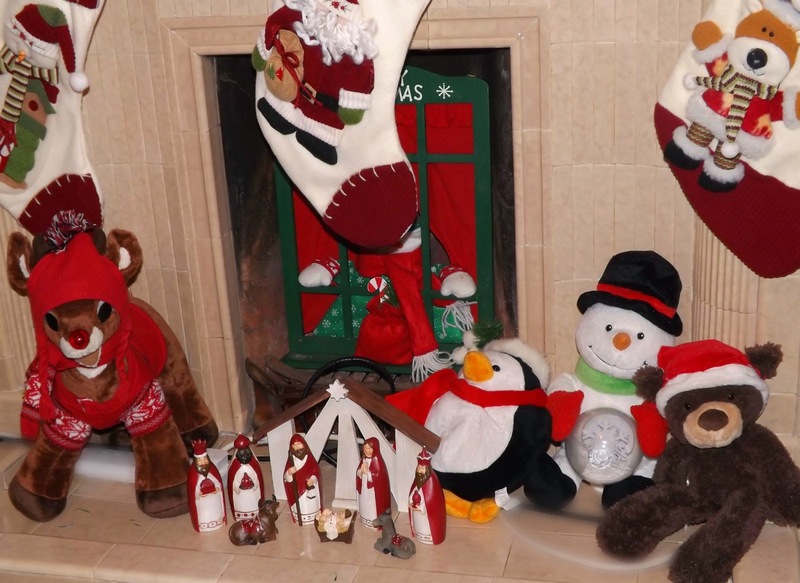 , various Christmas ornaments and my new Christmas House Rules sign on there too. In the fireplace itself I have a little Christmas window scene with a snowman peeking out, accompanied by Tyne's selection of musical Christmas cuddlies and our nativity scene. 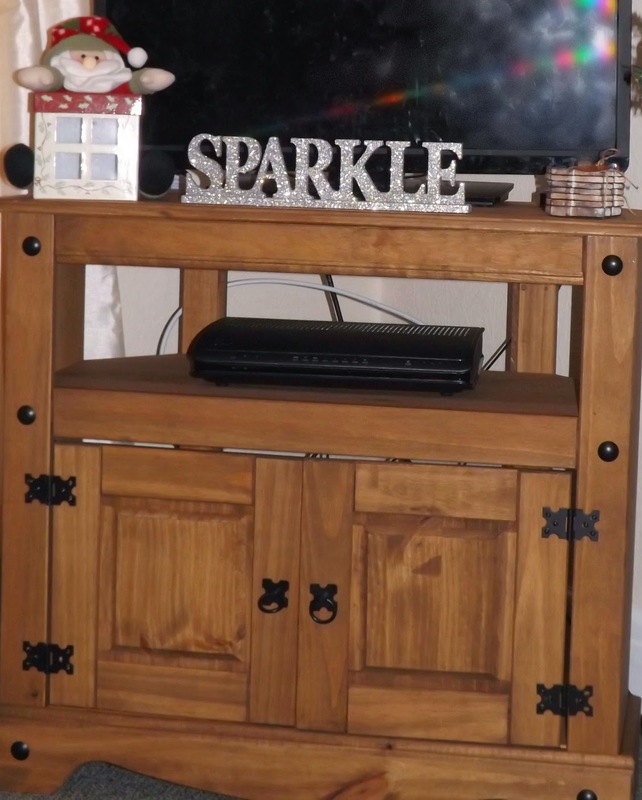 I needed a little nod to my blog somewhere as well of course, and this Sparkle sign seemed appropriate! 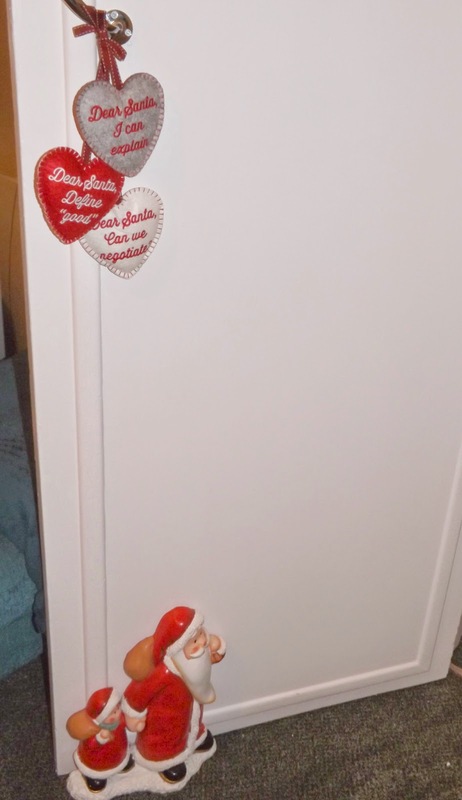 My felt hearts from Next are hung on the living room door, and Santa and his little helper are there sneaking their way out too! And this year I have a new wreath for our front door! I saw this at a local Christmas craft fayre and fell completely in love with it! Its so sparkly and unusual, I absolutely love it! So there you have it! 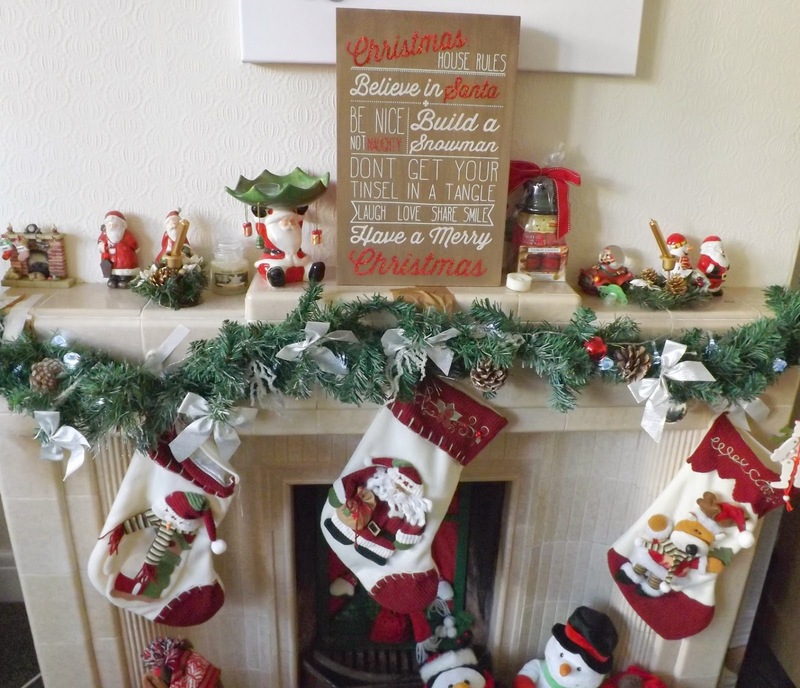 Our Christmas Decor 2014! If you've posted about yours, please leave me a link as I'd love to take a look! LOVE the tree! Those burlap angels are adorable!